It's a beautiful day in Björkhagen. 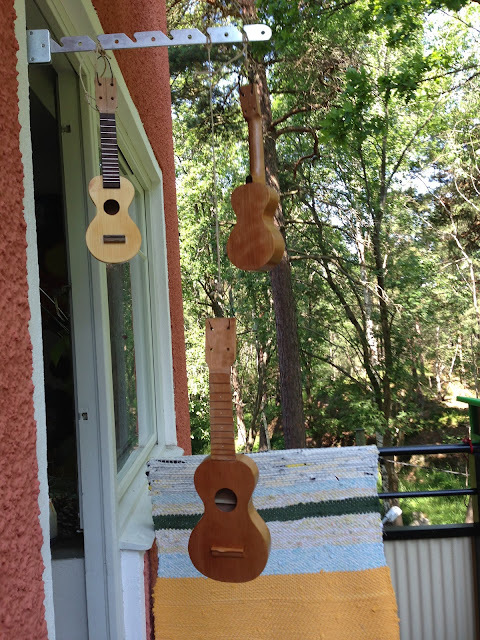 Sun is out, birds singing, loaves are rising and soon to be baked, and a few coats of shellac has been applied to the three ukes in progress. These will be my numbers 61, 62 and 63. The two miniatures are identical apart from the spruce tops. One is very tightly grained and the other one not so. In this size I don't think any difference in sound will be due to that, but I thought both the scrap pieces looked charming. My friend Robert will get to choose one for himself, the other one will go to the raffle in Hollesley. Despite being away a lot and going off again early tomorrow morning, I manage to squeeze in the odd half hour here and there. The result of the last couple of half hours are bridges, made and glued. I tried to include two rulers in the pic, both the piccolo and the minis are strangely small. The piccolo has a scale length of 280 mm, this year's minis have a 200 mm scale. A couple of frets and heelcaps into the finishing stretch I pause for a few days. I'm going to Spain for a wedding with Ann, the mini-mes will be with their grandmother. The weather in Spain? 38 degrees centigrade. Pff. The moveable feast that is the Argapa workshop has gone out to do some terraforming at the country estate. 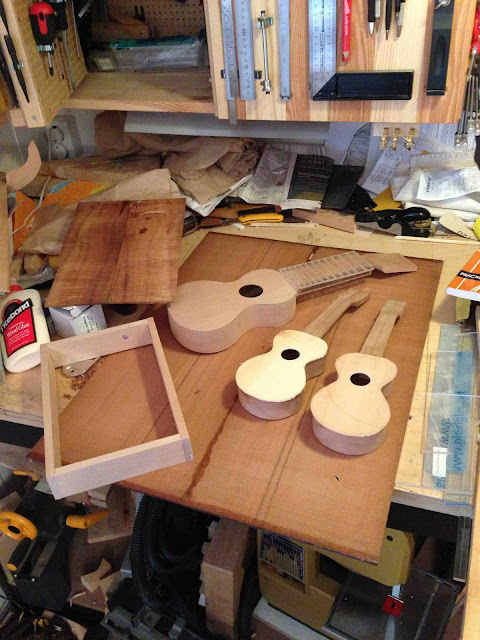 But some proper work gets done as well - the miniatures are sanded and the fretboards will both be glued before we go home. Chris' piccolo is sanded and I'll make the fret slots after giving the neck a wash coat of shellac. 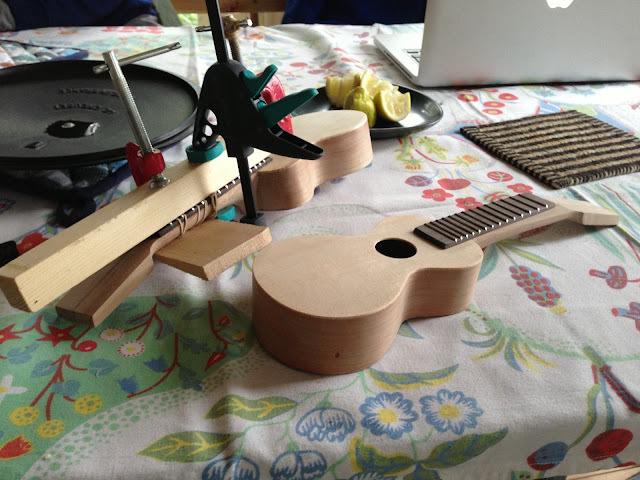 The two miniatures took a leap forward and have soundboards. The fretboards are ready as well but they're not in the pic. To the left you can see parts for a kalimba of maple and koa, and the large board will be the soundboard of a really strange instrument called "prongs and echoes" that I read about in a book by Bart Hopkin. It's a fantastic guitar sized soundboard that I got from Aaron Keim. Might be stupid to waste on an experiment, but what the heck. It'll be fun. 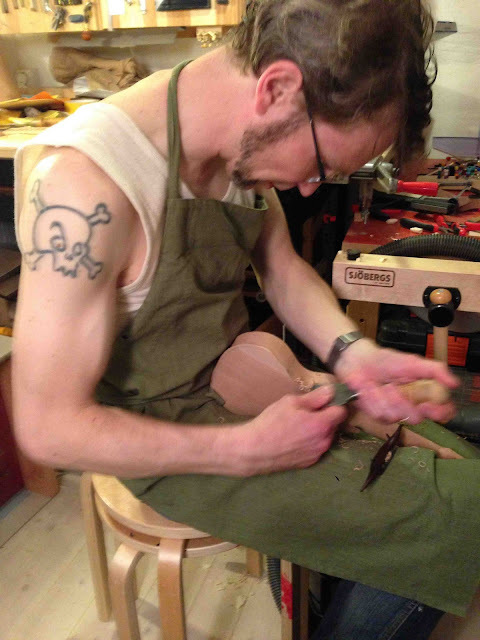 I use a miniature spokeshave and a giant chisel for this. It'll be done soon, if the finishing process goes smoothly. Just as I normally do when I see the completion at the horizon, I started a couple of new instruments today.